Gene Frenkle is not real, but people think he is. Marc Spitz said the Saturday Night Live sketch “More Cowbell” was “one of the first super-memes of the new century” in the New York Times. Even the band behind the music, Blue Oyster Cult, can’t outrun the cultural impact of Christopher Walken’s fever for more cowbell. Donald “Buck Dharma” Roeser, a founding member of BOC, told the Washington Post in an interview that people still ask the band about Gene Frenkle, the excitable cowbell smasher played by Will Ferrell. At the end of the sketch, a still frame of Frenkle reading “In Memoriam. 1950-2000” has people believing the man is dead. Too bad Gene was never really alive. There’s a slight chance a few people might be incredibly unfamiliar with the classic SNL so here’s a brief rundown for the unfortunate few. Guest host Christopher Walken plays music producer “The Bruce Dickinson,” and regular cast member Will Ferrell, who wrote the sketch with playwright Donnell Campbell, is fictional cowbell player Gene Frenkle, whose overzealous playing annoys his bandmates but pleases producer Dickinson. 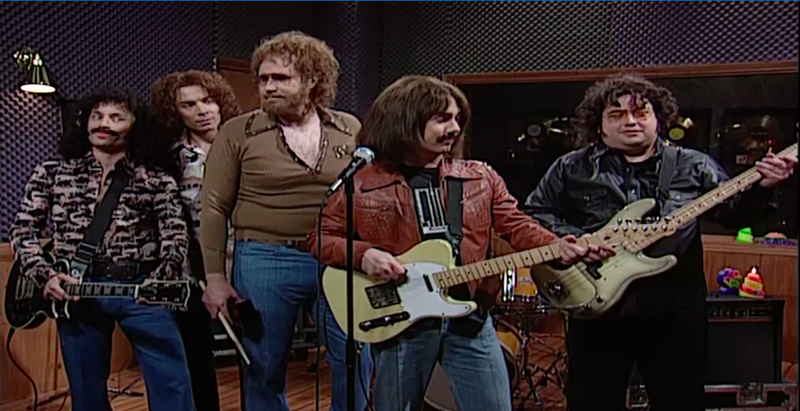 Starring alongside Ferrell and Walden in the sketch are SNL heavyweights Chris Parnell as Eric Bloom, Jimmy Fallon as Albert Bouchard, Chris Kattan as Buck Dharma, and Horatio Sanz as Joe Bouchard. Those four men portray actual members of BOC, though not spitting images, as the band will attest to on many occasions. The sketch is considered one of the greatest—if not one of the most recognizable—SNL sketches ever done. Rolling Stone ranked the sketch the ninth best of all time. The idea for a sketch materialized after daydreaming about the life of the cowbell player. Ferrell and Campell first submitted the sketch for the episode hosted by Norm Macdonald in October 1999. Lorne Michaels was unsure about the premise, even though the sketch was incredibly well received during a table read. Seth Meyers, a former SNL head writer, remembered that the sketch was submitted “at least seven different times” before making the show. Ferrell re-wrote the sketch for the new host, Walken, and wrote the part of the producer to fit with the actor’s signature speaking rhythm. The sketch aired near the end of the episode. “Don’t Fear The Reaper” was a top-15 hit in May 1976. In the four decades since the song’s release, it has appeared in more than two dozen films, TV shows, and video games. Bill Murray and Woody Harrelson toke up to “Reaper” in Zombieland (2009), and it scares the crap out of people during the opening moments of the Stephen King book turned miniseries The Stand, and even provides background in the 1978 classic slasher flick Halloween. It’s playing in the car as Jaime Lee Curtis tries desperately to evade impending doom at the hands of Michael Meyers. The SNL sketch is arguably the most iconic use of the song and most associated with the song. According to Roeser, the lead singer and author-composer of “Don’t Fear The Reaper,” the sketch pays homage to the song and band but gets several key elements wrong about its history. For example, Chris Parnell portrays the group’s lead singer, “Eric.” While Eric Bloom was the band’s lead singer, Roeser performs lead vocals on the song. Dickinson had no affiliation with the band at the time of the original recording. The song was actually produced by David Lucas, who had discovered the band and produced their first album. The real Gene Frenkle never existed. Well, there’s probably more than a few Gene Frenkles walking the Earth, but none of those men played percussion in Blue Oyster Cult. At the end of a May 16, 2009 SNL episode, Green Day performed “East Jesus Nowhere” with Frenkle assisting on the cowbell. Ferrell’s appearance was unrehearsed and the band had no idea Ferrell would appear. Frenkle carries on in tributes on Urban Dictionary and in this bizarre tribute video attempting to give a backstory to the man behind the cowbell.